Augusta, Georgia — Roars echoed through the majestic pine trees of Augusta National for decades when Arnold Palmer, Jack Nicklaus and Gary Player were in search of victory in the Masters, with the Big Three combining for 147 starts and 13 green jackets, including seven consecutive wins starting in 1960. 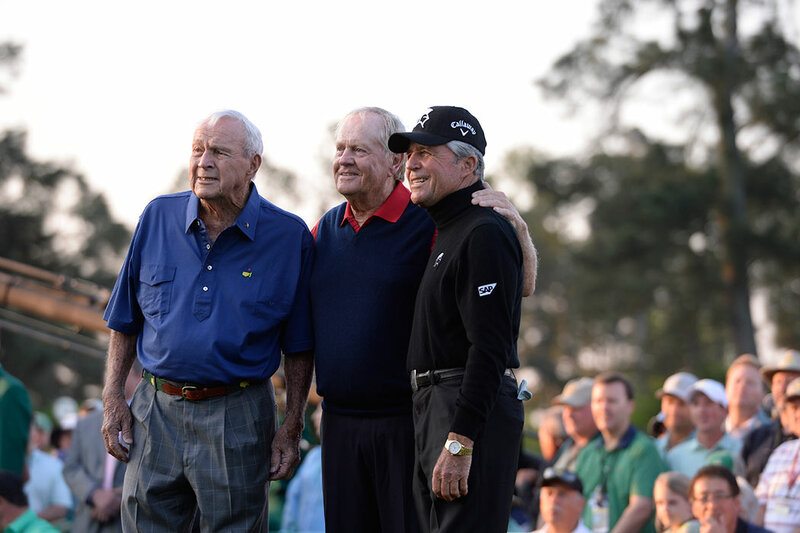 On Thursday, laughter echoed through the media center after the trio hit the ceremonial first tee shots of the 79th Masters. Right off the bat the three had media members at the first chuckle in their annual address. When asked about the 1965 Masters when the three were tied for the lead after 36 holes, they looked at each other waiting for the other to say something. The Golden Bear delivered the first shot. “I remember the third round,” he said. He should. Nicklaus shot 64 to take command and went on to win the second of his record six green jackets. “I remember it. The wrong man won,” Player said. “I don’t remember anything,” Palmer added. And the laughter was on. Palmer, still recovering after dislocating his shoulder in December, hit the first tee shot as Rickie Fowler, Keegan Bradley and defending champion Bubba Watson were on hand out of respect at 7:40 a.m. ET. It mattered little to anyone — except for Palmer — that it sailed over the large gallery and landed near the ninth green on the left. Player split the fairway with his drive, with Nicklaus coming up 10 yards short of Player with his. “I said, ‘Don’t fan it,’“ Palmer said when asked what was going through his head before taking his driver back. At 85, Palmer is the senior member of the Big Three, with Player a spritely 79 and Nicklaus 75. Nicklaus was asked if he wondered what he’ll be doing when he reaches the ages of his two friends. “I’m trying to figure out what I’m doing at 75. Nine holes on the Par 3 yesterday darn near killed me,” he said. “He’s not going to get to 85,” Player said. Nicklaus made a hole-in-one in the Par 3 Contest, his first Augusta ace. “Well, you’re counting yours, I notice,” Player countered. “But he’s got a course at home that he’s got a lot of 40- and 50-yard holes,” Nicklaus said. Then talk turned to drivers. “I just use whatever they give me,” Nicklaus said. “I’ve been using the same driver for 10, 12 years. … If you would have seen Arnold carve away on drivers when we first started playing on the Tour, I mean, he would get a driver and first thing you would see him do is get out a file and he would start carving away, and each tee he would be changing the grip. He would get in and change the shaft, bend the shaft around, and it was all hit-and-miss. It helped to have strong hands. Palmer didn’t miss a beat. “You wouldn’t give the ducks a drink if you owned Lake Okeechobee,” he said. As the laughter died down, Palmer perked up. “OK. I’m ready to go home,” as the media center erupted with laughter. But Player had the final word. “I’ll tell Barbara that,” Nicklaus said referring to his wife. And Player ended with one more story. He was staying at Nicklaus’ house during a PGA Tour tournament as the two were at the top of the leaderboard heading into the final round. “Now Barbara is making the breakfast, and I’m thinking, hell, I’m a bit worried about this, we’re tied. So when she put the eggs on the table and she went to the kitchen, I swapped them around,” Player said. “But it didn’t help because he beat me anyway.